Habit: Shrub, prostrate, 0.1--1 m. Stem: twig densely long-glandular-hairy. Leaf: overlapped; petiole < 2 mm; blade 2.5--4 cm, 2--3 cm wide, round to round-ovate, light green, sparsely glandular-hairy, base lobed, clasping, tip abruptly soft-pointed, margin entire, flat. Inflorescence: panicle, 3--5-branched; nascent inflorescence pendent, axis 0.5--1 cm, > 1 mm wide, long-glandular-hairy; bracts 5--10 mm, leaf-like, ovate, acute, glandular-hairy; pedicel 3--5 mm, glandular-hairy. Flower: ovary glandular-hairy. Fruit: 6--7 mm wide, depressed-spheric, glandular-hairy, sticky; stones free. Chromosomes: 2n=26. 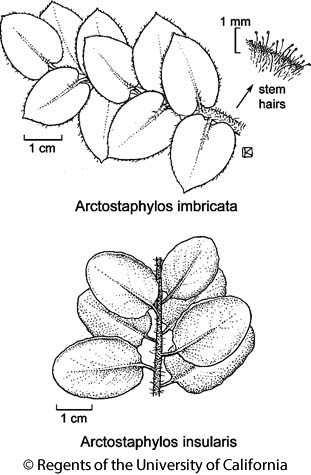 Citation for this treatment: V. Thomas Parker, Michael C. Vasey & Jon E. Keeley 2012, Arctostaphylos imbricata, in Jepson Flora Project (eds.) Jepson eFlora, http://ucjeps.berkeley.edu/eflora/eflora_display.php?tid=13935, accessed on April 23, 2019.